Shown below, the light at Little Sable Point on Lake Michigan exhibited a characteristic of fixed white with a flash of five seconds duration shown every 30 seconds. 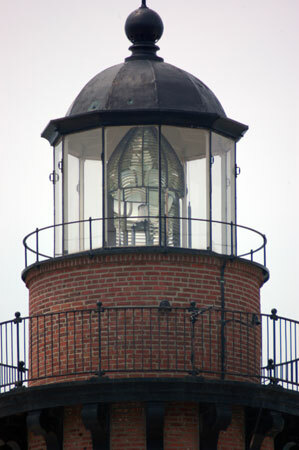 While a fixed white light with a flash was a commonplace characteristic, the way in which the flash was created at Little Sable was unique on the Great Lakes, and perhaps throughout the entire US lighthouse system. As shown below, in virtually all lenses which exhibited a fixed light with a flash, the central dioptric belt was equipped with bull’s eyes. Powered by a clockwork mechanism, the entire lens rotated around the lamp, with the light intensified and focused significantly as each bull’s eye passed between the light and the observer. 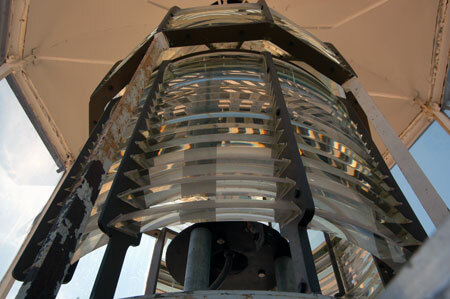 Shown here, the lens from the North Point light station in Milwaukee is typical of such a fixed/flashing lens. Because the bull’s eyes were located in the central dioptric belt, such a flash would appear to an observer to emanate from the center of the fixed white light. 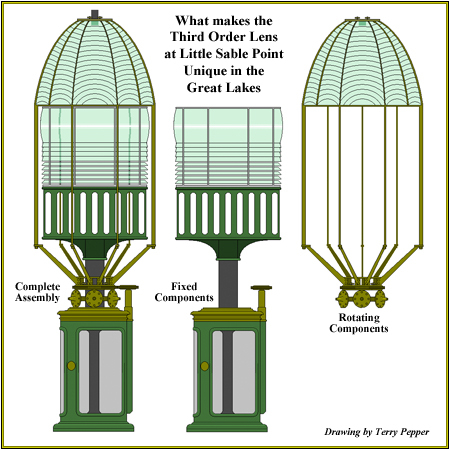 This illustration shows the unique lens and pedestal assembly from Little Sable Point lighthouse. Shown in the center, the central dioptric belt and the lower catadioptric prisms were fixed to the pedestal and did not rotate. Only the upper catadioptric section of the lens rotated suspended on the upper end of long brackets. A large ring gear around the bottom of these brackets was turned by a gear on the clockwork. Since each section of the upper catadioptric array was made up of radial prisms, a flash was exhibited as each section reflected and refracted out toward the observer. As such, the flash at Little Sable would have appeared to emanate from immediately above the fixed white light, as opposed to from its center. 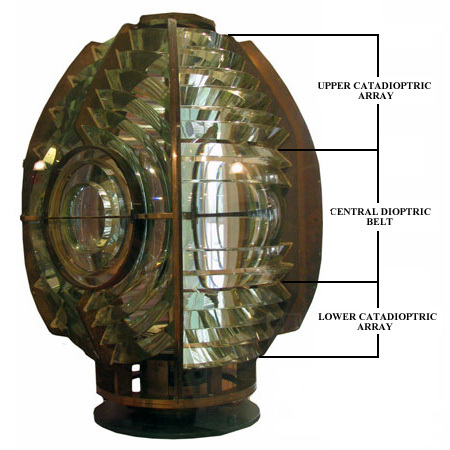 This view of the lens at Little Sable below clearly how the upper catadioptric array was separate from the central dioptric belt, and the vertical arms from which it was both supported and rotated from the pedestal below. Next time you visit Little Sable, take the time to check out this lens a little more closely – it may well be the only one of its type you will ever see.